Thunderbolts Forum • View topic - Catastrophic evolution vs "punctuated equilibrium"
Catastrophic evolution vs "punctuated equilibrium"
Re: Catastrophic evolution vs "punctuated equilibrium"
webo-, thanks for the info...I must admit, that other than what we observe as adapting within species, I don't understand "evolution". The last thing I heard about was the Hypothesis that viruses and bacteria played a big role in changes within the genetic codes. The suggestion that they and parasites still are affecting us in ways that have been attributed to other causes. This landscape would have consisted among other things of amino acids, proteins and complex RNA molecules. What's more, these molecules must have been part of a rich network of interrelated chemical reactions which generated them in a reliable way. "... other than what we observe as adapting within species, I don't understand 'evolution'." 1) "species" is very poorly defined in biology, and much more poorly in paleobiology. The textbook definition <interbreeding to form fertile offspring> is rarely ever followed in the field. Usually "species" just means <hey, I found something interesting> due to the virtual impossibility of putting the glossary version to the test. 2) "family" promotes an understanding of microevolution and the variety it produces within reasonable and observable limits. Sparky mentioned: "...the hypothesis that viruses and bacteria played a big role in changes within the genetic codes. The suggestion that they and parasites still are affecting us in ways that have been attributed to other causes." I like the viral connection in that it describes an interesting functional role for these protein-coated RNA containers besides that of disease-causing parasites. Mycoplasms may play a similar role role to retroviruses in transporting DNA/RNA information packets between organisms adding to the potential for variation among groups. Along with the explosion of knowledge in the field of epigenetics, we are seeing many active everyday contributors to variety within a family that have nothing to do with the impossible "positive" accumulation of random deleterious mutations or mind-numbing eons of impotent and ineffective time. At the same time, and reflecting upon the article quoted by PP, it accentuates that information comes from information rather than from accidental collisions of meaningless molecules. That would be a large fudge wouldn't it? Can they even create RNA molecules and proteins from a chemical soup without intervening somehow? What other parasites might be actively affecting human cognition? Neither catastrophic evolution nor punk-eek really works in any sort of a logical sense. Velikovsky's notion of catastrophic evolution probably explains some if not most of what you'd call microevolution, but there is no workable theory of macroevolution, all any real mutations ever do is lose genetic information and kill off the victims. While we agree on a number of things we don't believe, I have to say you have some very fantastical ideas regarding life from elsewhere in the universe salting the earth from time to time. The highly processed [faked? ]images of civilizations on Mars or asteroids don't attest well to your sincerity, and the artist reconstructions [Neanderthal illustrations] don't really do justice to the actual bone morphologies. There is a lot of wishful thinking going on in your website info. I'm somewhat sensitive to this as I have been accused of wishful thinking in the past, and have done a great deal of scientific research and field study to account for statements that I make. That being said, I appreciate you being around to liven up the conversation around here! Species: Felix domesticus, Panthera leo, Panthera tigris, Panthera panthera, Puma concolor, etc. Species: Canis lupus familiaris, Canis lupus, Canis latrans, Vulpes vulpes, etc. Strawberries, raspberries, plums, buttercups, crabapple, mountain ash, ocean spray, spirea, etc. What I would emphasize in relation to this thread is that taxonomy is highly subjective and generally based upon macroevolutionary premises, and in a turn-around of hugely impactful proportions, the taxonomy is then used as evidence for evolution! I have personally gone to the trouble and exercise to download three or four of those ESA and NASA images which appear to show desert areas and made the adjustments to lighting and contrast (with the Free Software Foundations "gimp" package) which turns those images into images of tall buildings and urban infrastructure, to determine for myself whether or not the people making those claims are crazy. You clearly have not made any similar effort. 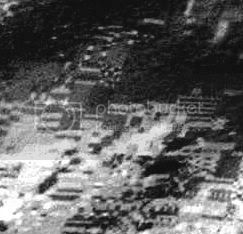 The other point I could bring up is that I have worked with applications including steganography which require some knowledge of jpeg and other image format schemes, and can state with total certainty that there is no way any sort of image handling artifacts could produce the kinds of structures which I am calling urban infrastructure in those Mars images. and then tell us what he's looking at the wrong way and you might want to tell NHNZ (Natural History New Zealand) as well as they're in the process of producing a television series dealing with Vendramini's work. Wow!!! A thousand references! And some of them by people who actually disagree with him [I've read a few of those articles and books myself, so I can vouch a bit for this]. Nice collection! Such a list of references is kind of like having a Ph.D. or graduating from Stanford. How can anyone not believe the conclusions drawn by such a literate person!!! I'm duly impressed. I have a very intelligent friend who programs black boxes for airlines; he is a computer simulation expert who sincerely believes the entire universe is simply a hologram. Very smart and very nice guy. I don't believe a word he says. A mnemonic from long ago, relating to the hierarchy in biology: "King Phillip Came Over For Ginger Snaps." "Like I say, what I get doing that doesn't look at all like a desert:"
Is it your opinion that this is an active civilization, and if it is, then why haven't we heard from them? 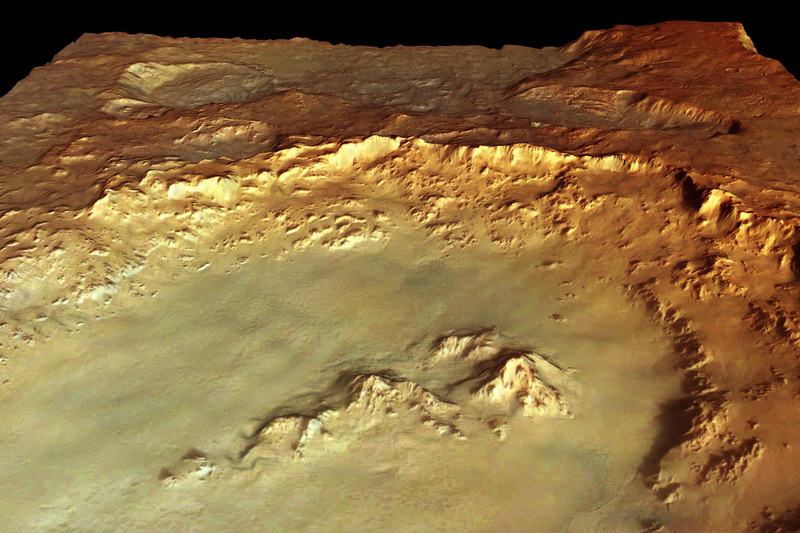 Surely if there were activity there we'd have picked it up in previous Mars' expeditions. It seems to me to be the remains of a previous civilization. It seems to show farms, roadways, cities--everything that a civilization needs. Except that it seems to be frozen in time. What do you think may have happened to it, if it isn't there? Although I don't agree with the author's conclusions, he does present some very interesting evidence for an electrical event as the cause of the 13,000 bp extinction events. He thinks that an interstellar blast of some sort is responsible for the event, and I think it is because of a "grazing" event by a very large. electrically-charged object. Since his work was published, there have been further discoveries that yield more light on the event. For instance, there has been the discovery of magnetic microspherules in a layer that dates to that period, 13,000 bp, in an area that stretches from the West coast of the US to the Eastern seaboard. especially along the Delmarva (Delaware, Maryland,Virginia) peninsula and extending southward to the Carolina Bay region. These magnetic particles are consistent with an electrical discharge of some sort. Also consistent with an electrical discharge are dozens of "pot holes" in the Earth in the same region. An upward-arcing electrical branch could easily have excavated them, and have also thrown into the atmosphere tons of sedimentary solids that settled out in the region. One way to determine if the sediments were of local origin is to analyze them; if they came from the local (~500 km) area, then something upset them and caused them to relocate in their present position. It was about this same time that the Sahara desert came into being. Previous to that, the area was a lush, tropical region. But suddenly it became a desert, over a period of a very few years, probably less than 10. What could have cause such a sudden change? A vast electrical arc, struck from the sky, which killed all the greenery and all the seeds, except that which was near a vast ground, an oasis. The water was the ground for the arc and it was the only thing that prevented the arc from killing everything. There is still a vast underground body of water underneath the Sahara desert. Gonna post this now, but there is more to follow. Goes to China and the Gobi desert and the subterreanean Black Sea ruins and other issues. One of the things that has puzzled me is why didn't all the magafauna (the wooly mammoths, the mastadons, the giant sloths, etc.) disappear while the elephants survived? I can come up with two guesses: 1) The DNA of the elephants was not affected by the electrical strike; or 2) the elephants were out of the "kill zone", meaning that they were far enough south of a strike that they survived. I think 2 is closest to the truth. The breeding stock of modern elephants came from southern Africa and from southern Asia. The "kill sone" went just to their North, and they survived. If this hypothesis is right, then a massive electrically-charged object, at least as large as the Moon, made a grazing pass at the Earth about 13,000 years ago. Its effect was felt most strongly from about 15 degrees South latitude to about 45 degrees North latitude, in a wide swath across the Earth. Whatever happened, and however it happened, I do beleive it is in our best interest to know, to the fullest extent of our knowledge, what it was.